Well a week just flew by in a breeze. It is weekend again. Although I know the weekend breakfast blogging is meant for, well weekend cooking, which means taking more time to prepare and enjoy breakfast. In oppose, I either sleep late on weekends or eat out. On weekdays though, I prefer to enjoy some healthy homemade breakfast before going to work. Knowing that I have a lovely breakfast waiting for me seems to be a pretty good motivation to get out of bed. Now that is the best alarm clock in the world, don’t you agree? So I had this really good, healthy and substantial muffin recipe from 101 cookbooks really long time ago in my to-do list, which I cannot resist sharing it here. I can’t seem to find this post anymore in that blog, so I could not link it, but I will share my adapted version here though. 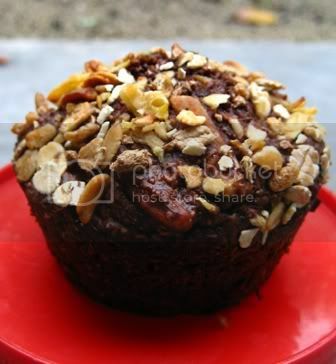 This muffin turns out great the way I imagine it would be, slightly chocolatey, with good thick texture, occasional encounter on soft raisins and crunch on the nuts. To top it off, it uses all the readily available ingredients in your pantry and is really versatile for substitutions accordingly. These huge muffins can only keep for bout 3 days in room temperature but fret not, it freezes really well, so far I still have 2 left in my freezer and it is still keeping well. Whenever I wanted to have it the next day for breakfast before work, I would take one out the night before, put it in a tall container and leave it in room temperature, and by the time I wake up in the morning, it is ready to eat. No better reason to wake up than breakfast; pour a cold glass of milk and enjoy with this yummy muffin. Eating one is enough to fill you up for the whole morning, without feeling as if you ate too much. It’s really good and healthy too! Give it a try. I had, as usual, adapted the recipe to suit whatever I have or can get my hands on. Anyhow, feel free to experiment. Besides, I had halved the recipe to make do with my mini oven, thus there are cases like half a ¼ cup, which I hope you would understand, I advise to double the recipe since it freeze so well, for rainy days. 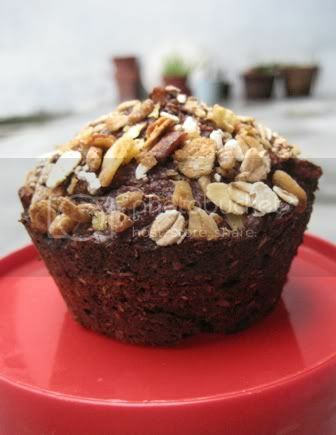 The oat and bran cereal topping is optional, but it does give the muffin a novelty look besides adding more crunch and flavour to it. You can use whatever oat bran cereal you have, or even granolas. Remember to push it down slightly though when you sprinkle on before baking, as quite an amount of mine fell off during removal. Combine flour, brown sugar, cocoa and baking soda together. Add in mashed bananas, yoghurt, egg white, vanilla, nuts, raisins and coconut. Pour batter into the muffin pan and top with the oat bran cereal. Bake about 25-35 minutes, or tooth pick is clean when inserted.